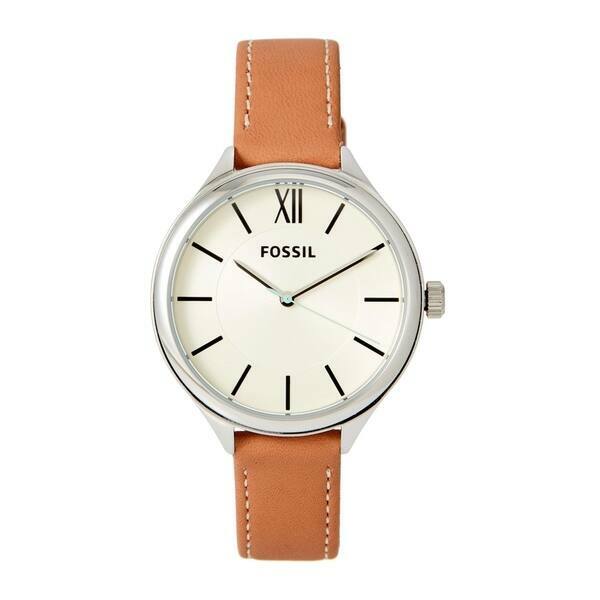 Silver stainless steel case with brown leather strap. Fixed bezel. Off-white dial with silver hands and black index hour markers. Roman numeral marks 12 o'clock position. Quartz movement. Mineral crystal. Push/pull crown. Case: diameter 36mm thickness 9mm. Band: width 14mm length 7.5in. Pin buckle. Water resistant up to 50 meters / 165 feet. Functions: hour, minute, second. All measurements are approximate. A Fossil tin box is included.